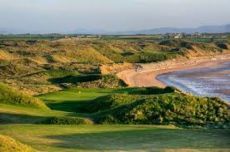 BallybunionGuesthouse.com has golf packages for your trip to Ireland. March/ April and October Old Course Golf Packages. One round of Golf on the Old Course guarenteed. One round of golf on the Robert trent Cashen course. Two nights B&B at the Tides Guesthouse. breakfast included in the morning. Cost 200 Euros a person sharing. May / June / July / August and September Old Course Golf Packages. Cost 295 Euros a person sharing. Or send an e-mail inquiry form below.